Come and say hi, as I’ll be at this premier event for European startups. Come and say hi as I’ll be at this great new competition for European startups. Here is the meetup page. Come and say hi as I’ll be at this influential competition for French startups. A great new event in New Europe. Please contact us if you are interested in sponsoring a TechCrunch meetup here. Come and say hi, as I’ll be at this cool new event for startups and VCs in Rome. Please contact us if you are interested in sponsoring a TechCrunch meetup at this new European conference for Mobile 2.0 startups and investors. A TechCrunch meetup held in conjunction with TechLudd (the Irish startup networking event). 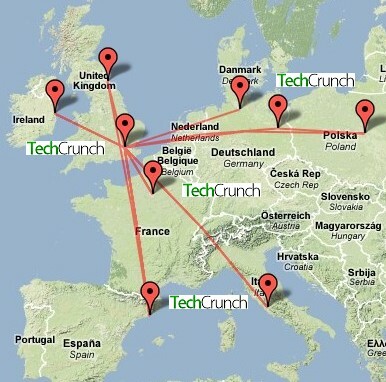 Watch TechCrunch UK & Ireland for details of the event, to be announced soon. Save the date! (A little more info is here). TechCrunch UK has started organising events, including a recent London Meetup TechCrunch Dinners (our first was with Scott Rafer here). We are looking for other notable speakers for panels and events, so please get in contact if you are going to be in London at some point and we’ll schedule you in. We are also planning some “TechCrunch Drinks” events in London. And we want to do other meetups around Europe (and I mean all of Europe, including Eastern Europe), so please get in touch about sponsoring and co-organising those with us. Thanks!